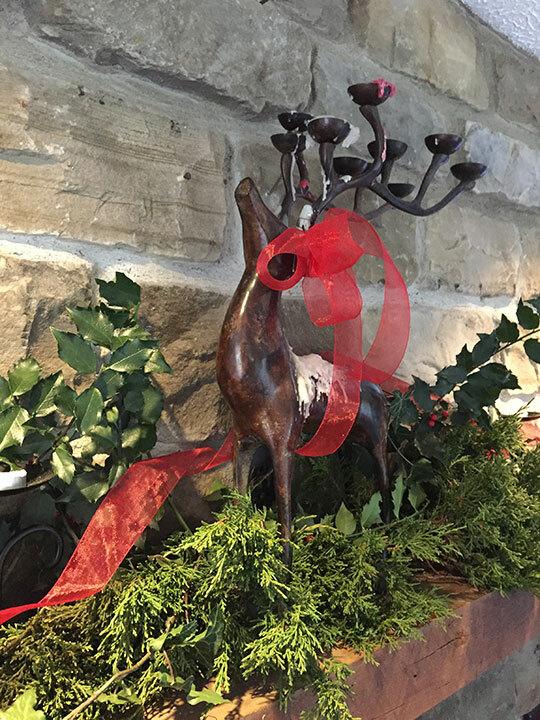 Part of the fun of the holiday season is “decking the halls” and decorating for the season. By bringing the symbols of the season into our homes, for festivity and communion, we are able to deeply align with the living earth and her turning seasons. 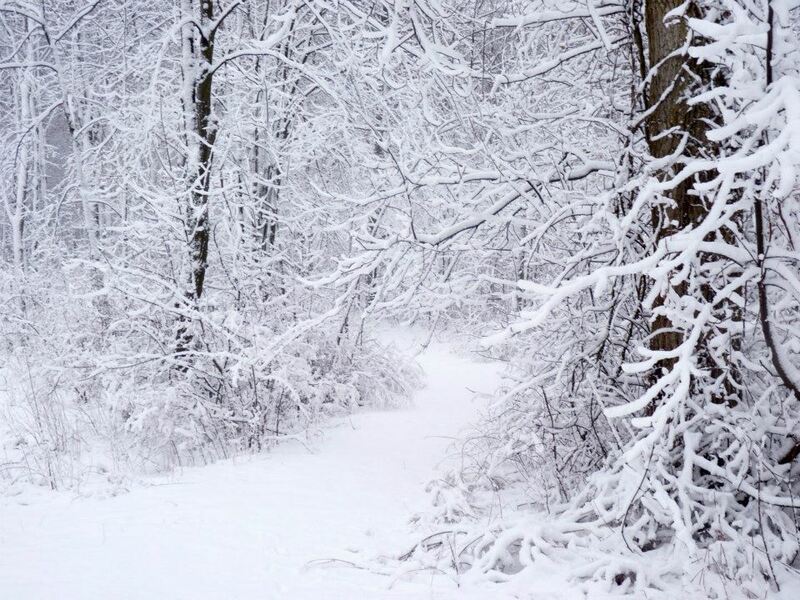 And the symbols of this particular season, at the winter solstice, span back millennia: deep red berries and dark green conifers, trails of ivy, mistletoe, and other evergreens. Adding to this, the symbols of the season are also reflected in mythology, such as the battle between the Oak and Holly king and the Goddess Frigga’s wheel of the year. These symbols have been with us for centuries in one form or another, and weaving in and out of whatever dominant tradition that is present. 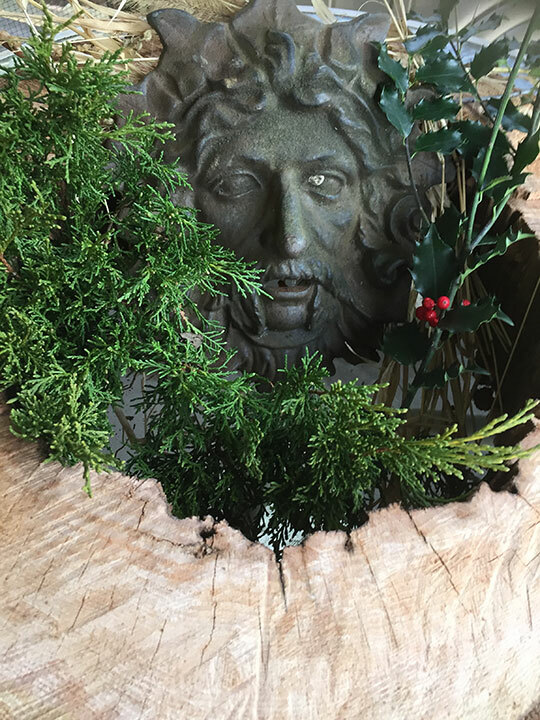 And so, in this post, I will explore how we might use natural materials, gathered lovingly from the living earth, to create our own holiday decorations: holly, ivy, various dried grasses, conifers, and more. 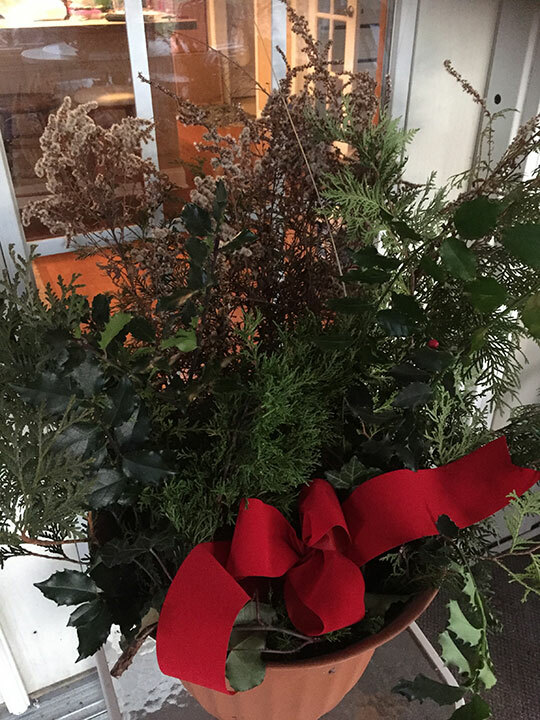 This can compliment, supplement, or even replace purchased decorations and can be returned harmlessly to the living earth after the holiday season is over. I’m going to start with some background and reasons why you might want to go a “handmade” and “grown” route, offer suggestions on things to forage and find, discuss the spirit and magical work of creating and crafting, and then talk about some easy ways you can make simple holiday decorations. 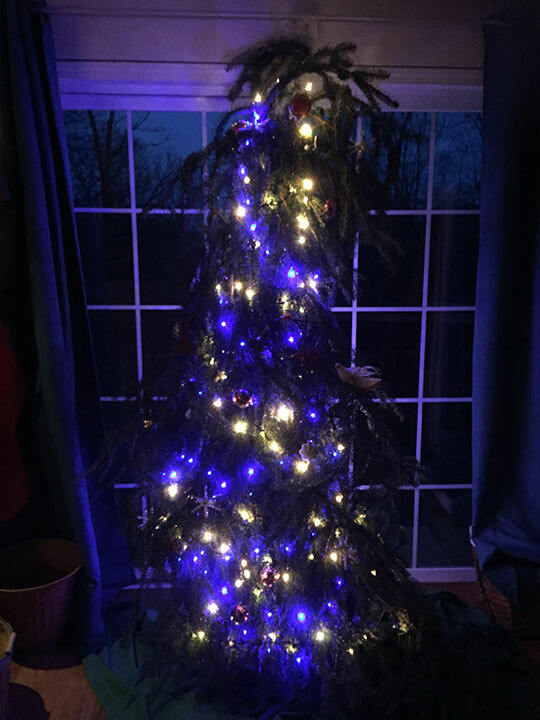 As a druid concerned with my own ecological impact and who engages in serious land healing, putting up a tree or figuring out how to decorate always represents an ethical conundrum. Obviously, I don’t want a plastic tree, as plastic trees are just another commercialized commodity. In fact, holiday decorations are a serious industry; in 2011, Americans spent somewhere around $6,000,000,000 on decorations. This land–and landfills–are now filled with inflatable snowmen, icicle lights, and even these crazy laser shows you can project on your houses, and more. These decorations are easy to purchase, easy to use and certainly, easy to throw away. Even holiday greenery, like fresh greens, are now a commodity to be purchased anywhere from your local grocery store to big box store. To me, I want to steer clear of commercialized holiday decorations because it feeds into the cycle of purchase-use-quickly throw away and because I can’t be sure of the manufacturing processes or ecological impact on the earth. Even a used plastic tree is problematic to me–I’m not into the facsimile, I want something real. I want it to smell real and be real. 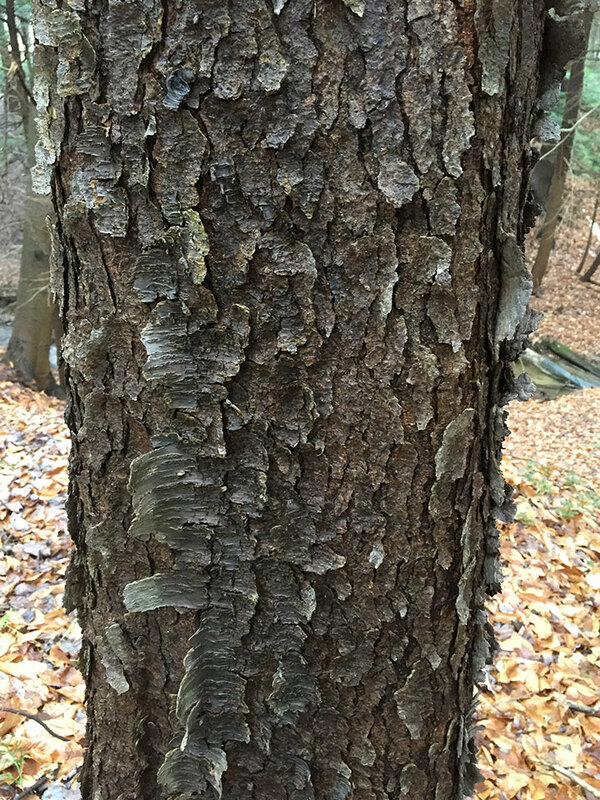 And yet, a typical living tree also presents an ethical issue. 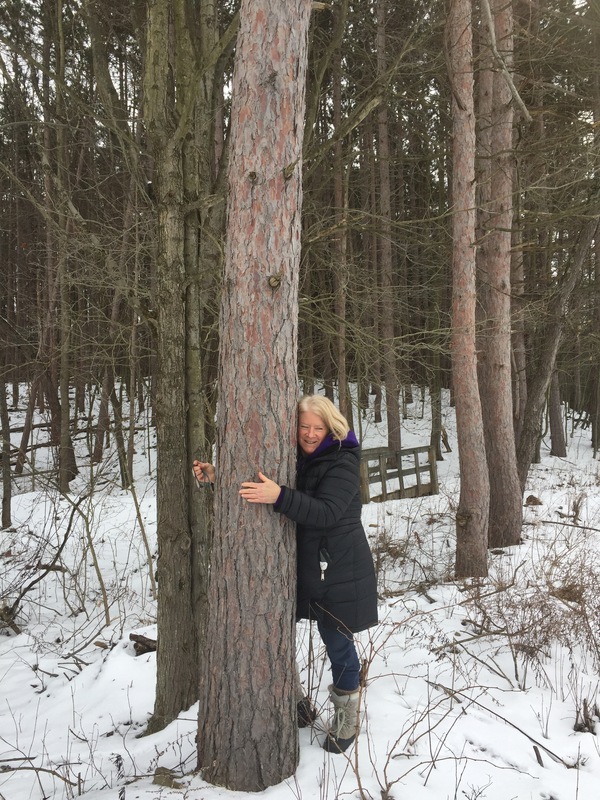 As someone working to live a nurturing and regenerative lifestyle, I don’t want to purchase a living tree that would be cut down so I can enjoy it in my house for a month. I think as I gain experience as a woodworker and I could put the whole tree to use, I might begin to feel differently. But at this point, putting up a tree in my house for a month to celebrate the turning wheel of the seasons simply aren’t worth a life of another being. To address this, a lot of people opt for the “living tree” in a pot or with a root ball as an option, but they are often quite expensive and/or hard to source (around here, all you can only find cut trees; my town claims to be the “Christmas Tree Capital of the World” and takes great pride in high quality cut trees, so there isn’t much of a market for anything else). Long term, I might cultivate an evergreen in a pot and bring it in each year for the holiday season so that I kept using the same one again and again (otherwise, this home would be filled with conifers (not fruit trees) in a few short years! 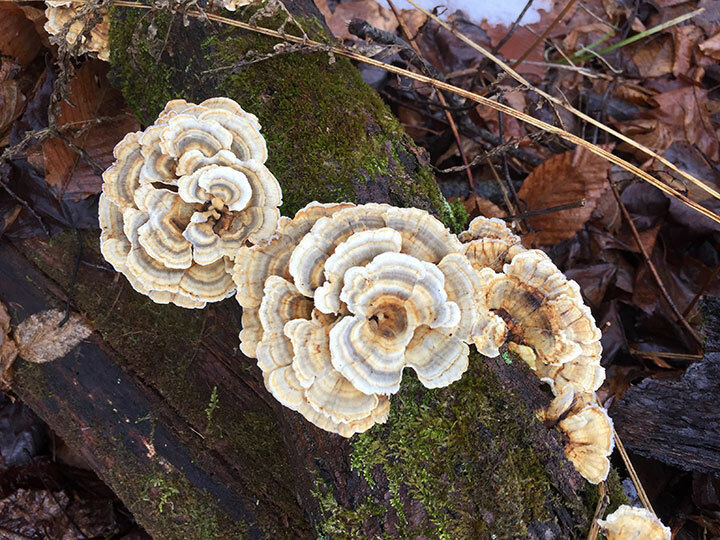 And so, with this conundrum brewing and family quickly approaching for a festive feast on the 25th, this year, I decided to continue explore decking the halls the old fashioned way–with help from nature herself. 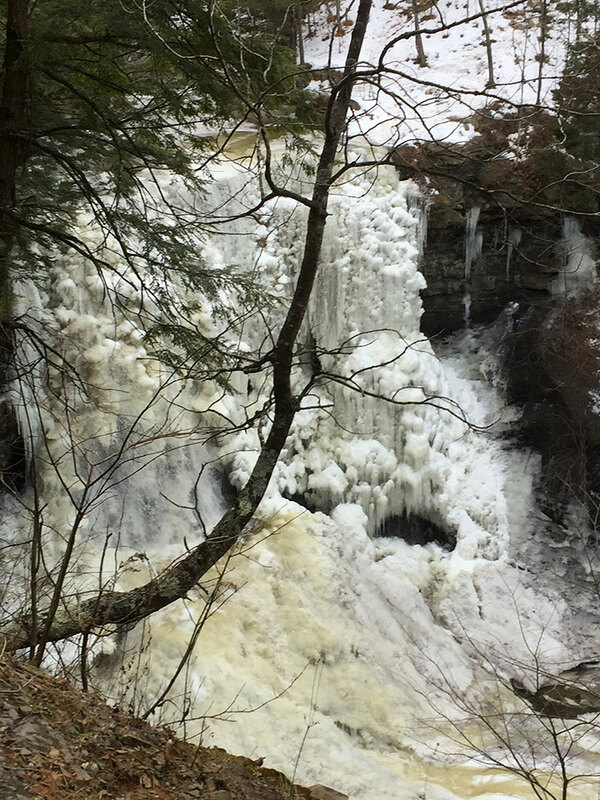 Long before big box stores and plastic commodities, the only thing that was available was what nature herself provided–this is why we have evergreens and reds for this time of year: looking on the landscape, that’s what is available right now. Before commercialization, this was the only way to decorate–and I think its worth exploring how we might get back there. Of course, the question of what to source and how to source it is a good one. If you are going to use real live materials for your decorations, you might start by seeing what is available in your surroundings (and I’ve offered a bit of a guide below) and even scope things out earlier in the year. I have found that its relatively easy to find materials even when I was renting: particularly, from friends, neighbors, family, or your own land. Most conifers make really nice holiday decorations–and certainly, they form the background of the “evergreen” that helps remind us of spring even in the darkest time of the year. Like anything else, they dry out and drop needles, and so finding ones that hold their needles longer is helpful if you want your decorations to last. Fir trees: Many fir trees are prized for their uses for swags, wreaths, and living Yule trees. They smell great and hold their needles for a long time. They also aren’t too prickly to work with. Blue Spruce: Blue spruce is a very prickly conifer but is quite beautiful. If you want to work with it, I suggest you wear leather gloves. It has a really firm and strong branch and needle structure, and so, it makes a nice Yule tree, it is also good for baskets and swags. White Spruce: I actually did most of my decorations this year out of white spruce, primarily because I had a lot of it to trim to make more light in my garden. It makes particularly nice wreaths as it is pliable, bendable, and won’t stab you like its blue counterpart. It also lays nicely over mantles, etc. White Pine: White pine is a very feathery tree with long, soft needles that are very bendy. It makes nice basket decorations and also nice wreaths (like white spruce). My family used these as holiday trees for many years because we had planted them, and as kids, we always played games to see who could manage to hang the ornament on the tree on the first try (as the White Pines don’t hold ornaments well). Red Pine/Jack Pine: Red pine and Jack pine are both more firm with smaller, more prickly needles. They work great for swags, baskets, or a “constructed tree”. 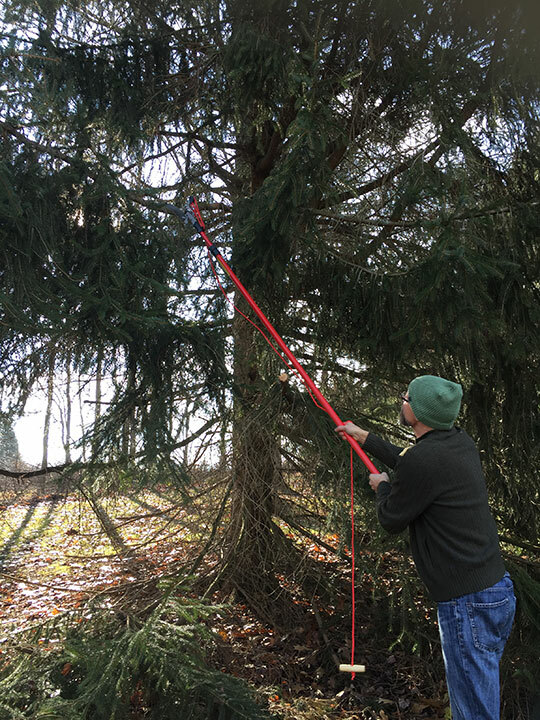 Eastern Hemlock: Hemlock is very abundant where I live but makes extremely poor holiday decorations because the needles will drop within 2-3 days of the branches being cut. As much as I love the hemlock tree, this is one to keep outside. Evergreen materials that are non-conifer in nature are also amazing to work with for holiday decorations. Many of these are often planted or foragable in the wild. Bittersweet vine: Bittersweet is considered an “invasive” vine in many parts of the US, and this time of year, it still holds onto its lovely red berries. You can weave these into wreaths, mantle pieces, and more. I had a lot of this when I lived in Michigan and I would make lovely wreaths and such each year with it. Holly: Holly shrubs also produce holly berries, which gives us two of the most common colors for the holiday season. They are evergreen and hold their shape and berries long after they dry out, making them useful for all sorts of decorations. Even when fully dry, it keeps its shape and color quite nicely (although once in a while the berries will pop off). Ivy: I love working with Ivy as a holiday decoration. I usually use it to wrap around other wreaths or as a mantle decoration. Even when fully dry, it keeps a nice dark green color for several months. Periwinkle: Periwinkle is a low, evergreen, ground cover that often moves into forests in a mat and prevents other plants from growing–so take as much as you want. 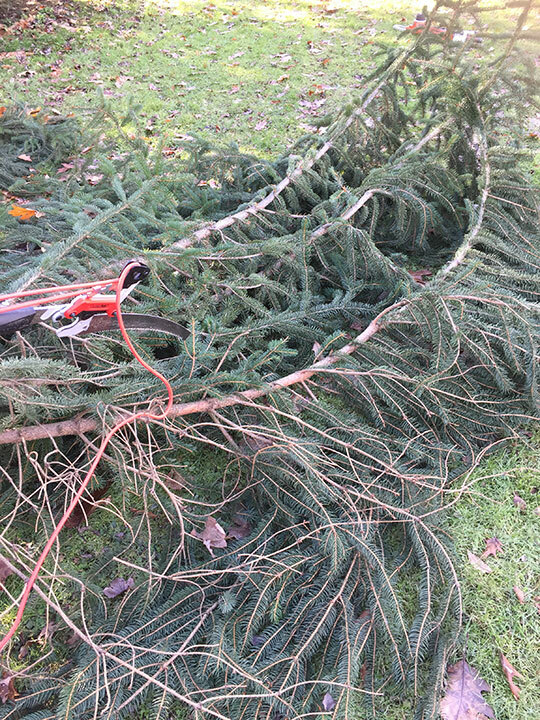 Its hard to pull out, but you can cut it close to the ground and make wreaths, etc. Wintergreen: I like to use small amounts of wintergreen plants for small decorations. 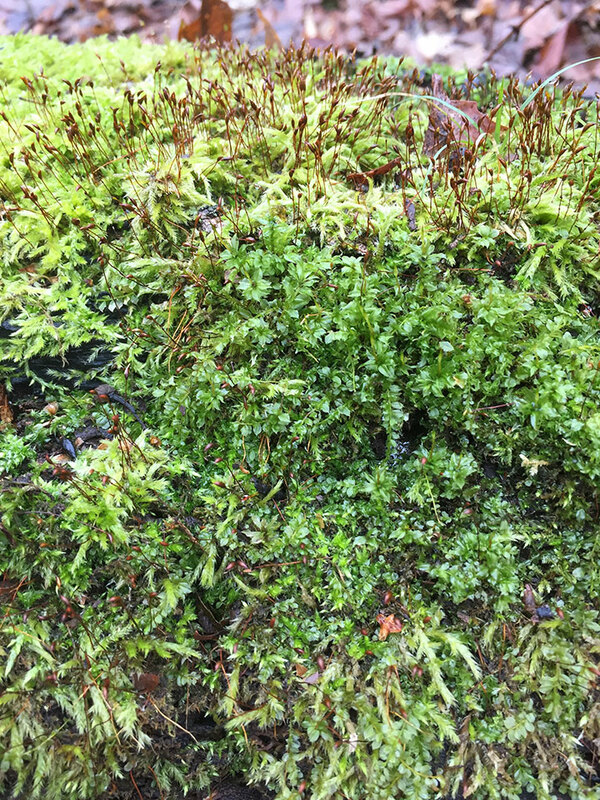 They are small and low growing, but are evergreen and smell wonderful. Use only if abundant. Partridge Berry: Like wintergreen, this is a small low-growing evergreen that often has red berries. Given its symbolism, I like to use this (or wintergreen, above) in the place of mistletoe, which does not grow around here. A good place to cut back the ivy and use it or decorations! Dried Grasses and Plants: I love using dried grasses and plants. Sometimes, I will brush some gold acrylic paint onto these to really make them pop. My favorites include milkweed pods, dried goldenrod, dried lobelia, and more. Take a walk in any field and you will find tons of nice things you can add. Pine Cones: Can be added to many holiday decorations and, again, brushed with gold or silver for extra effect. Popcorn: Stringing popcorn is a fun activity to do with friends and family and really compliments other natural decorations. Red and Gold ribbon (red, gold), preferably wired. This ribbon can be used and reused again and again. I think part of the magic of finding your own materials is bringing in that energy and honoring the plants that you are gathering. When I gather, I like to ask permission and honor any tree or plant that I take from. I explain to the spirits of the plant and the land what I would like to do, and invite them into my home as I harvest the decorations and craft them. This adds an additional magic-filled element to the preparation of these decorations. I also think that crafting decorations for the Winter Solstice a few days before the solstice can help you get into the “spirit” of the season, bringing you in alignment with the everlasting qualities of the dark conifers–they stay green, and they give us the promise of spring. Handling them, smelling them, infusing our homes and hearths with them, helps us accept the darkness and work to move beyond our own darkness. Baskets and vases full of greenery are about the easiest things to make and will certainly give you some easy success. Stuff some greenery in a vase, maybe add some dried grasses and berries, and then, add a bow. This year, I used old planters (that still were half full of dirt) and easily made a few baskets in under a half hour. You can do the same with smaller vases, mason jars, and so on; really anything that has some weight to it that will hold greenery. 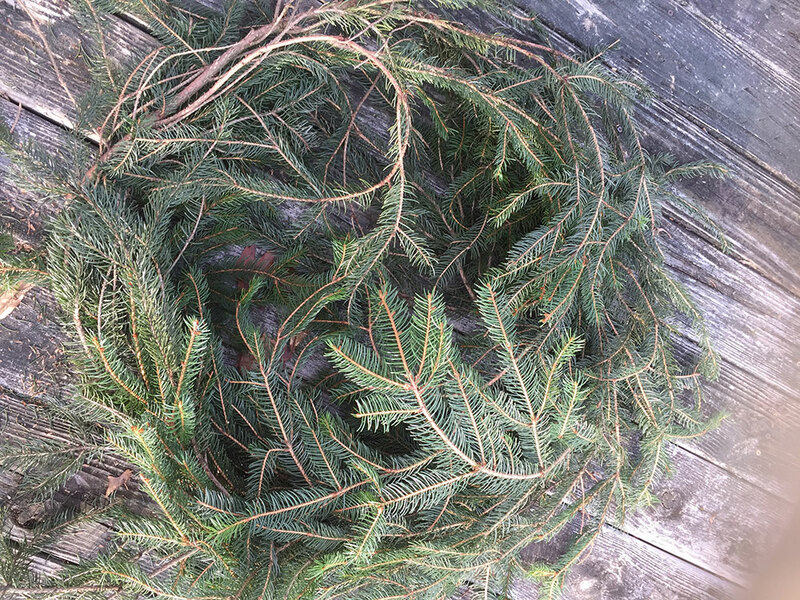 Wreaths are simply a circle with a hollow in the middle, and can be easily made by finding pliable conifers and wiring them together (fir, white spruce, and white pine make particularly good wreaths). 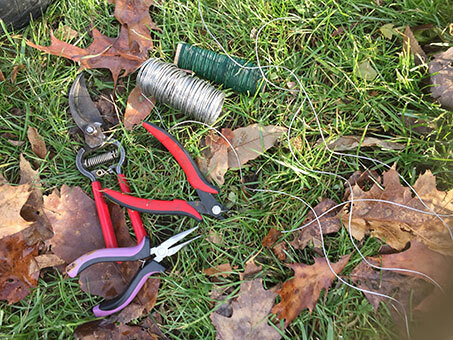 Simply place them in a circle, get green wire, and wire every four to six inches. Then, you can wrap it with ribbon and do any final trimming necessary. Then find a nice place to hang it! Swags are simply an easier kind of greenery wall display than a wreath. You wire some branches together, add some berries and a bow, and add a hanging hook. These can replace pictures or even be added above a door, on a table, etc. 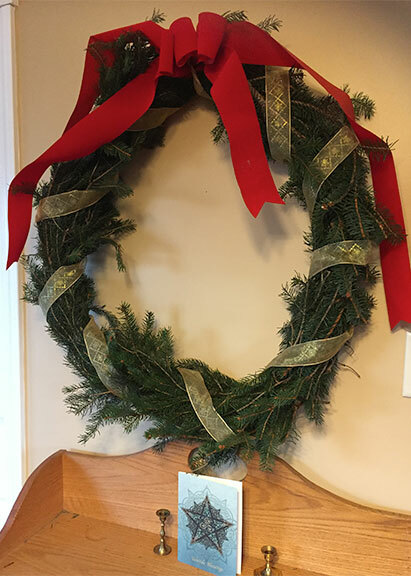 Completed wreath: wire, ribbon, and white spruce – beautiful! 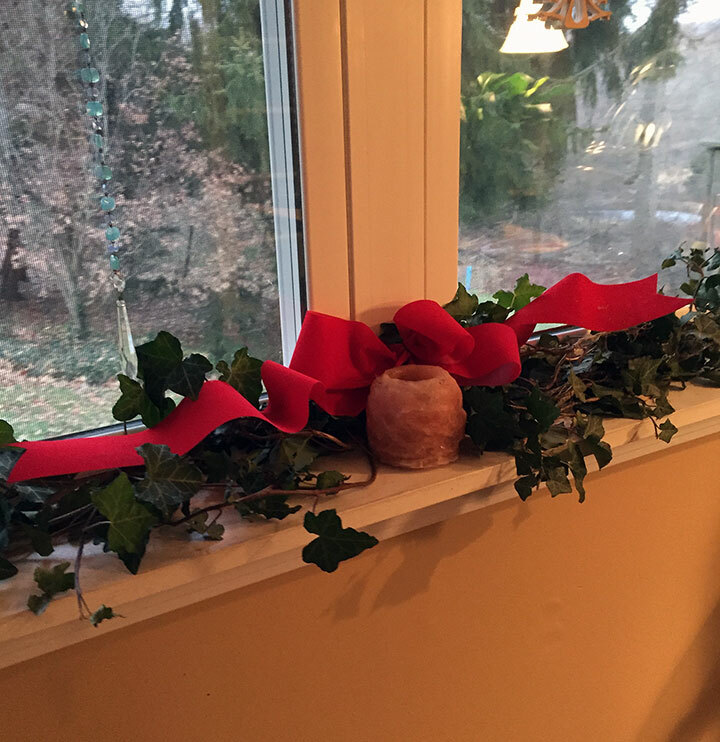 A really easy way to use the greenery, berries, and grasses is for decorated windowsills and mantles. These allow you to have some festive cheer without necessarily having to “construct” anything. To do this, simply lay greenery in a pleasing way along your windowsills, add some ribbon or a bow, or candles. Even a few ornaments look nice in these displays. For mine, I primarily used holly and ivy, as I had a lot of that material and it lays well. As I mentioned above, I made my own yule tree this year. 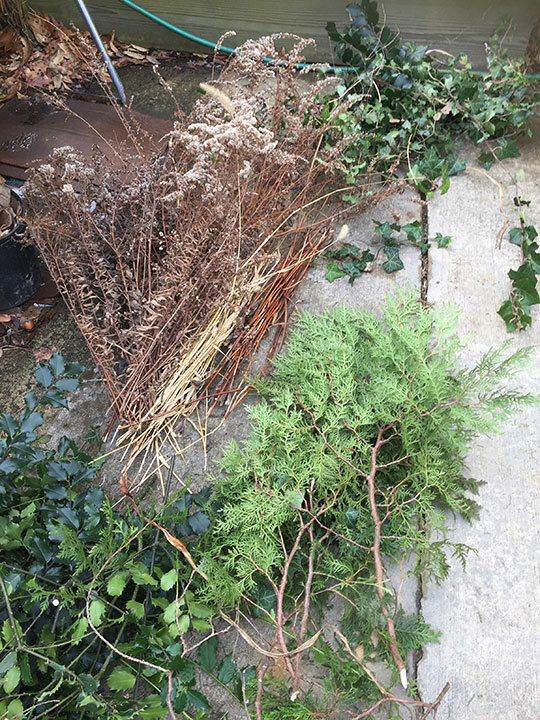 I had a number of branches to cut down to make more light in my winter garden (photos above), and I was determined to do something nice with them beyond simply compost them. And so, after about a half hour to an hour of wiring and pruning, I managed to get the three large branches wired together and in the house. I used strong steel wire and plyers. Then, I carried it indoors and set it up in a tree stand. It actually worked, and from nearly every angle, looks like a weepy yet wonderful tree! Once the holiday season is concluded (for me, I usually leave decorations up through the dark month of January and take them down just before Imbolc), I will gather these materials back up, save the bows for next season, and add everything to my compost bed. Everything from these will be returned to the land to participate in the cycle of life. I hope that everyone has a blessed and wonderful winter solstice! I will be taking a few weeks off from blogging until after the New Year. Blessings of the holiday season and the darkest time of year. Humans evolved in alignment with the movement of the sun and the moon. As the sun moved, so did human camps of hunters and gathers. As the sun moved, so still move many birds, fish, and mammals as they migrate to avoid the biting cold. As the moon moved, so do the cycles within our bodies, the tides and flows, and wildlife. The sun and moon cycles are literally woven into our blood, into our DNA, and however disconnected some of humanity currently is from the cycles of the sun and moon, they are still there, ever present. How many friends or co-workers still talk about the full moon and how intense people get? How many people in the USA celebrate thanksgiving and a harvest season? How many people feel like staying inside during the darkest time of the year? The cycles of the celestial heavens are there, shining each day, if we only heed them. So today, I’d like to spend some time reflecting on the cycle of the sun in our lives, and how we can use this cycle within and without. This is especially pertinent because, at least where I live, the grumblings of winter have already begun and reflection helps us through the cold and the dark times. The Moon and the Sun’s phases repeat themselves throughout our lives (whether or not we want them to), and we can see their same patterns occurring again and again. The graphic that I’ve used as a teaching tool that accompanies this post helps explain one way we can interpret these phases of the sun (and also we can apply this to understanding the moon phases as well). These are my own interpretations, but they are drawn from many years of living by the seasons as a homesteader, herbalist, and wild food forager, as well as 10 years of study in two druid orders, where we celebrate and meditate upon the cycle of the seasons. Even if you don’t celebrate these events as holidays, they still have much to teach all of us in terms of life cycles. 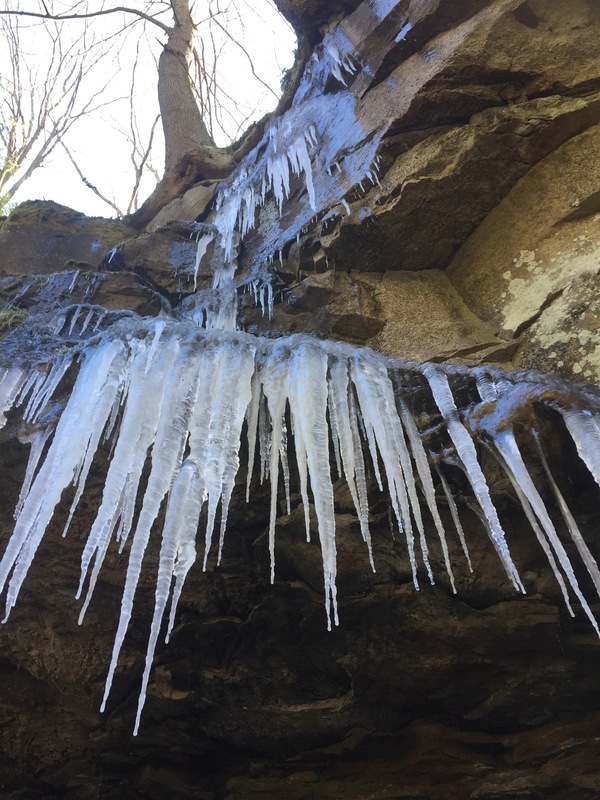 The yearly cycle of the sun encourages us to understand that there are times of scarcity and abundance in our natural world, that there are times of high energy and growth and times of death and quietude, and that everything has a season. 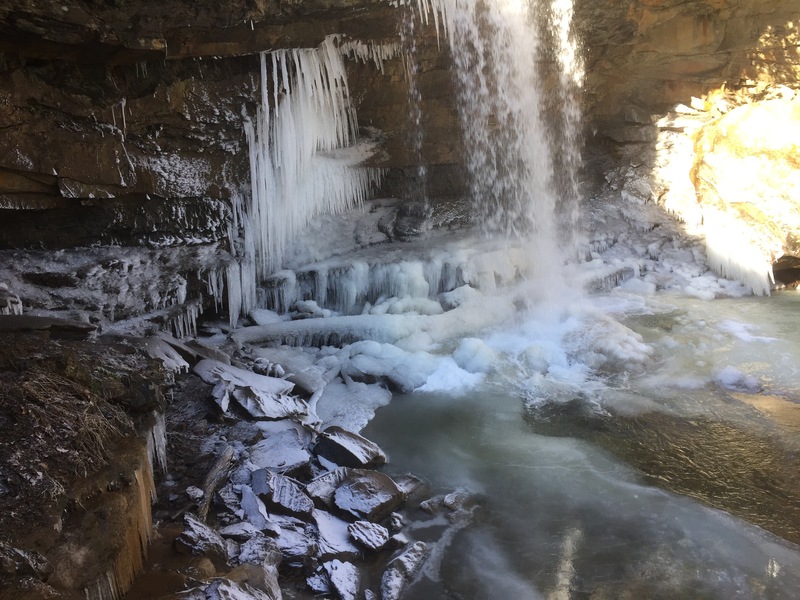 Why does winter come? So the trees and land can rest before spring is reborn anew. This cycle encourages us to understand that we must have both of these times in our lands and in our lives. The summer solstice (Alban Hefin in the druid tradition) is the high point of energy of the year, with the longest day. 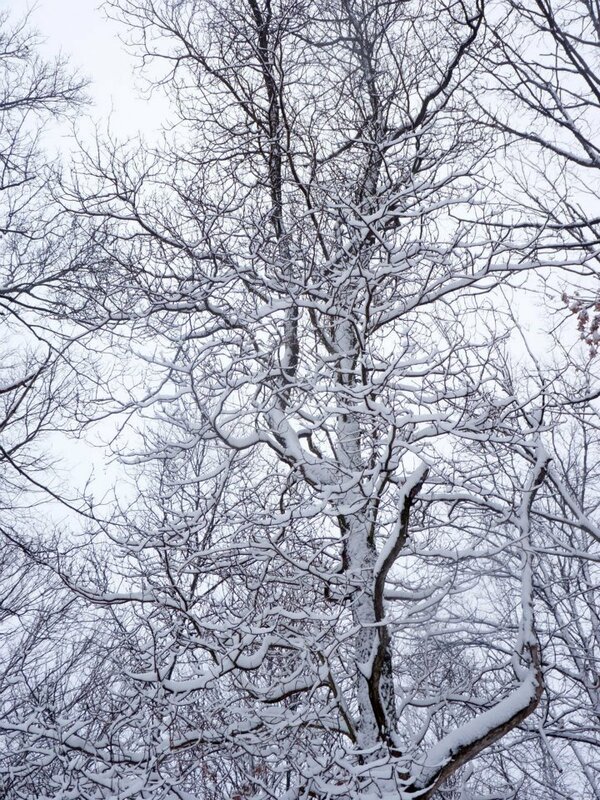 The winter solstice is the low point of energy of the year, with the longest night. On either mid-point, we have the equinoxes–the explosive growth and time of new beginnings at the spring equinox, and the harvest and reaping rewards and winding down at the fall equinox. The Sun’s full phase takes 365.256 days, and often teaches us lessons that are more long-term in nature (as each “year older” we are is a passing full phase of the sun); while the Moon’s full phase is 28 days (with each phase 7.38 days), and mirrors the phases of the sun in a shorter period of time. As the moon goes from dark to full and back again, it energetically creates periods of growth and beginnings, building energy, peaking energy, falling energy, and quietude. Each of these phases is consistent, unavoidable, and part of the human experience. I think we’ve forgotten this quite a bit in our modern world, where each day is regimented into work weeks and we are always supposed to be at our peak performance. Dear workplace and modern life, it is not always high summer in our lands–why should you expect high summer performance 365 days a year? There isn’t a time for rest, there isn’t a time for reflection–its just go, go, go. Modern life gives us no time for anything but full “high summer energy” from us, and yet, that’s not realistic of human limitations and needs. This unrealistic expectation and leads to the glorification of busyness and the burnout of so many of us. I think its interesting that we talk about it as a sun cycle, because that’s how we see it from earth. But its really an earth cycle that we are talking about–the movement of the earth around the stationary sun. The cycles are affected by the sun, but they are really earth cycles–how the sun is impacting the earth. The sun is masculine, and it is protective in nature. The moon, on the other hand, revolves around the earth and is impacted by earth much moreso than the sun–and the moon is the passive and feminine principle. So even the movement of the celestial bodies themselves reflect the principles they embody. Balancing and Planning: Its during the Spring Equinox (March 21st) that we can first look to the start to a new season and begin to cultivate plans in our lives. The spring is a time where, after the long rest and rejuvenation of winter, we are able to start anew and build new ideas. When we are excitedly making plans for the future, the message of balance is a critical one, and one that physically manifests during this period. In the physical landscape, by this point, farmers and gardeners have ordered their seeds and have begun to start them; and while we don’t see much in the way of new growth in many places in the Northern Hemisphere, the melting snows and returning light show the promise of spring. 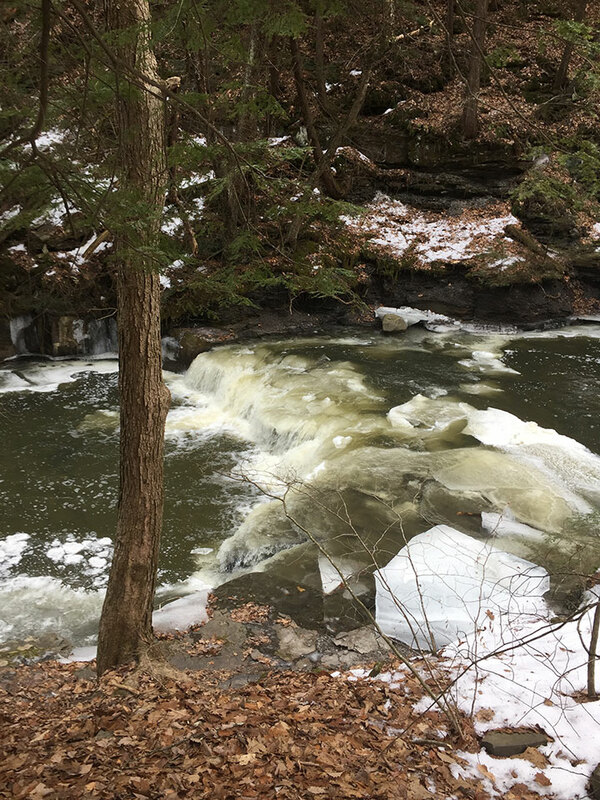 I remember on my homestead in Michigan, as soon as the pond ice would melt around this time period, you would see life in the pond. 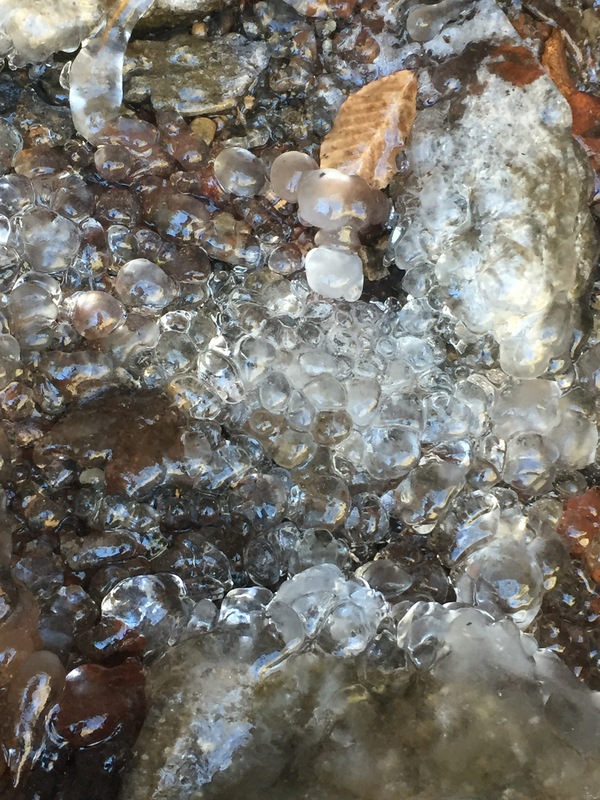 The water was only a few degrees above freezing and the ground was still covered with snow, but there was all this moving about on the warm edges of the melted water! Sowing: May 1st marks the point where the “spring” energy is really coming back into the land. Traditional celebrations around May 1st (May Day) involve many fertility symbols, like the maypole or the Beltane fires. The energy of this time isn’t only about physical fertility, but rather how we might sow seeds for many other kinds of things: creative projects, more positive relationships, finding ways of expressing ourselves, and more. This is the time when the flowers come back, when the nectar begins to flow, and when green is slowly returned to our lands. Energizing and Growth: With the sun shining at its brightest and strongest of the year on June 21st, the Summer Solstice is a time of energizing and growth! The sun provides Vitamin D, a critical nutrient that supports strong bones and teeth—the very foundation of our bodies. Upwards of 60% of Americans are deficient in Vitamin D–we are all in need of more sun. Spending time observing nature at this time shows us that we are in the height of summer—the first summer berries are in, the plants are growing vigorously, the trees are thick and lush, and much herbal medicine is ready. Celebrating: Its not surprising that July and August are traditionally the months where people take a vacation—these months, even in a traditional society—were less busy than the coming fall harvest season. We don’t take enough times in our lives to truly just celebrate the positive things in our lives and simply spend time with those we care about—and this period of the sun’s cycle (around August 1st) encourages us to do this. These are the lazy days of summer, before schools begin again, when there is time to camp, to frolic in the fields, and to enjoy the coming harvest. Balancing and Harvest: With all the work of planting, sowing, and growth comes the expectation and excitement of the harvest—when all of our hard work pays off. 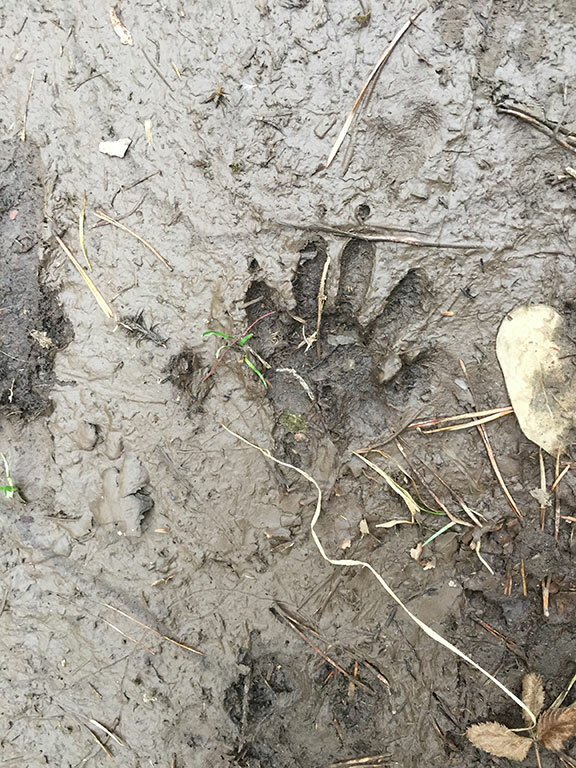 The land, too, is literally bursting at the seams in late August and throughout September with many of the traditional foods that would sustain people through the long winter: nuts, fruits, apples, pumpkins, winter squash, potatoes, and more. The Fall equinox (Sept 21st) also marks the point where we move from the light half to the dark half of the year—and a time for us reflecting and regaining balance in our lives. Composting: We are uncomfortable with compost in this culture. Things are thrown away, discarded, but not always composted. The lesson of this time in the sun’s cycle can be a difficult but necessary one. As things that are no longer needed or no longer serve us build up around us, it is critical to clear them away and transform them so that we can move forward in our lives. Composting, in a physical sense, is what happens when the trees drop their leaves each season—these leaves turn into soil over time and that soil is host to a whole web of life. 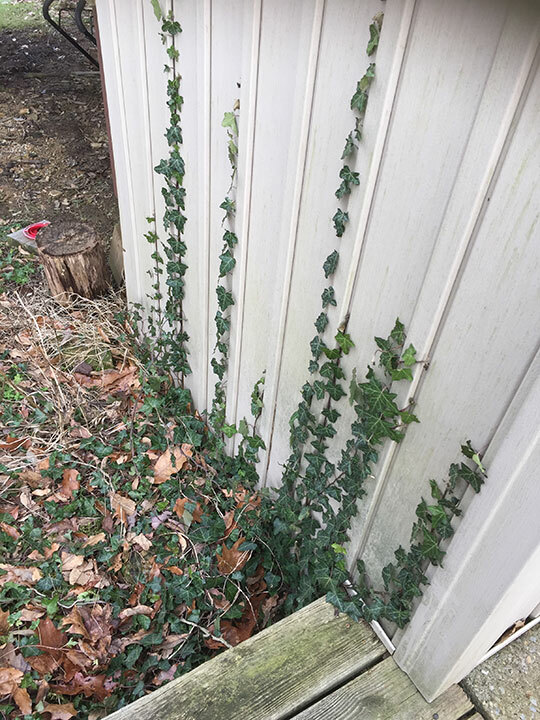 In the life of a farmer or gardener, this is when you clear out the old annual plants, trim things back, mulch your perennials, and prepare for the cold season—this is necessary work if anything is to grow. Failure to clear out the old prevents the new from coming forth. And by Samhain around November 1st, the land (at least where I live) is cold and appearing lifeless. Resting: Despite modern surrounding productivity and cultural values encouraging staying busy and being workaholics; the lesson we learn from the sun cycles is that in order to be abundant and produce a harvest, we must rest, and this rest must be equal to every other phase in our lives. It is at this point, during the darkest night of the year (December 21st), that we can look to nature for guidance. The trees are still, their roots growing deeper into the earth; the perennial plants are alive and yet resting in their toots; living off of the stored nutrients of the past year. The beehive is sealed up, living off of honey stores, waiting for spring. Even many animals rest and hibernate during this part of the year. Without this resting period, the land would quickly be worn out. Without rest, we too are quickly worn out. This period of the sun’s cycle also provides an additional lesson: this is the time of darkness on our lands, but it is a naturally occurring process. This does not suggest that the dark are evil or to be avoided—they are a natural parts of our lives, and we can learn from them—and look forward to the sun’s light again. Rejuvenating: As part of our rest in the dark half of the year, we need to find ways of rejuvenating our bodies, our minds, and our spirits—and February 1st is a perfect time to do this: light candles, take hot bubble baths, drink warm teas, find creative time, and get a weekend away! Rest is different than rejuvenation—after a period of rest, we are ready to inspire ourselves, treat ourselves, and start to look ahead. Even if our lives in practice don’t reflect the cycles of the sun, what they do reflect for us is the importance of these periods of time in our lives. Do we get real relaxation? Do we get to nurture our own creative energies and birth things in the world? Do we have times to celebrate, to harvest, to compost, and to simply be still? The sun is there, each day, teaching us its careful and patient lesson. The moon, too, is always in her phase bringing in her quiet light. These cycles give us deeper understanding of ourselves, and principles to live by, principles that can help us create harmony and balance in our lives every day of the year. I like to take time regularly to reflect upon the sun and moon cycles in my life. 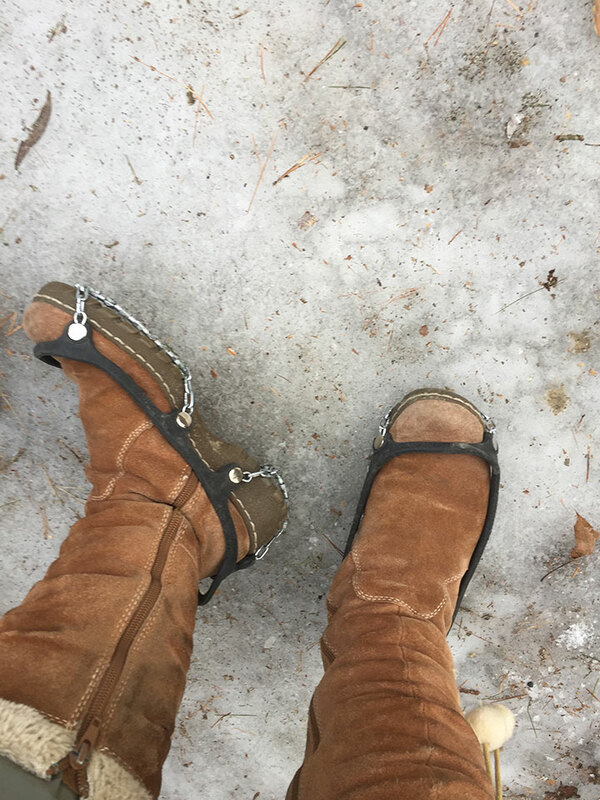 They help me balance, they remind me to rest, they comfort me when the composting or dark times are happening. I hope they do the same for you. 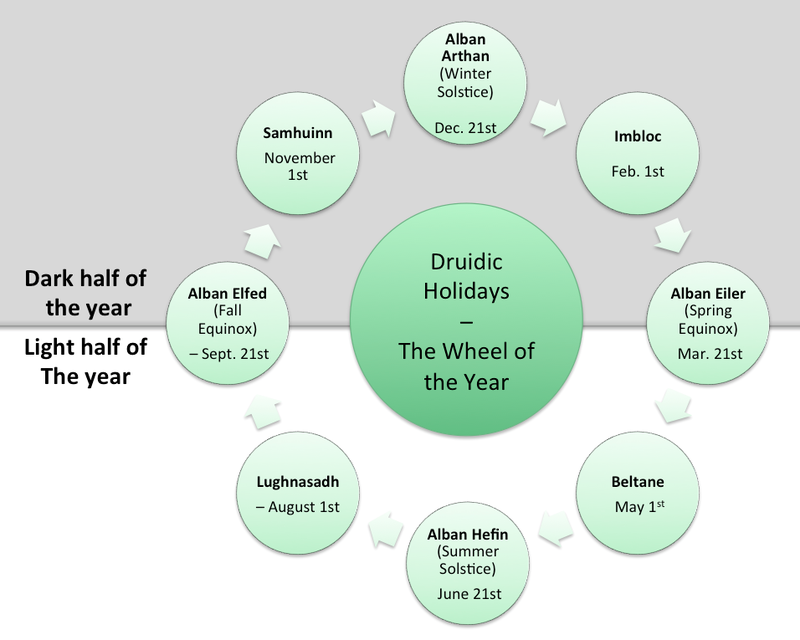 For more writings on the yearly cycles, see my posts on the Druid Wheel of the Year, a guided meditation, and Sustainable Activities for the Fall Equinox, Winter Solstice, Spring Equinox, and Summer Solstice. For our grove’s spring equnox / Alban Eiler celebration, we also had a Druidry workshop that focused on introducing some of our grove members to the wheel of the year. I thought the workshop went quite well, and the information from the workshop could be useful to others, so I’m posting both the handout and the guided meditation on my blog. The workshop started with a guided meditation that introduced people to the wheel of the year–if you are working solo, you can record the meditation in advance and then listen to the recording. If you are working in a group, you can have one person read the meditation and the others can follow along. Begin with three deep breaths. As you breath out, let go of any tension, stress, or negative emotions. Continue to focus on your breath, clearing and calming your mind. We will now take a journey through the Wheel of the Year within your inner grove. The land shifts a final time around you as the sun sets and darkness once again comes to your grove. You are back where you began, at Samhain. You and your companions draw closer to the fire. The leaves have fallen, the stillness in the air speaks of cold winter nights and a darkening landscape. Even though you know that it will be darker still before it becomes light again, you realize that this is a cycle of seasons that has occurred since the world began. 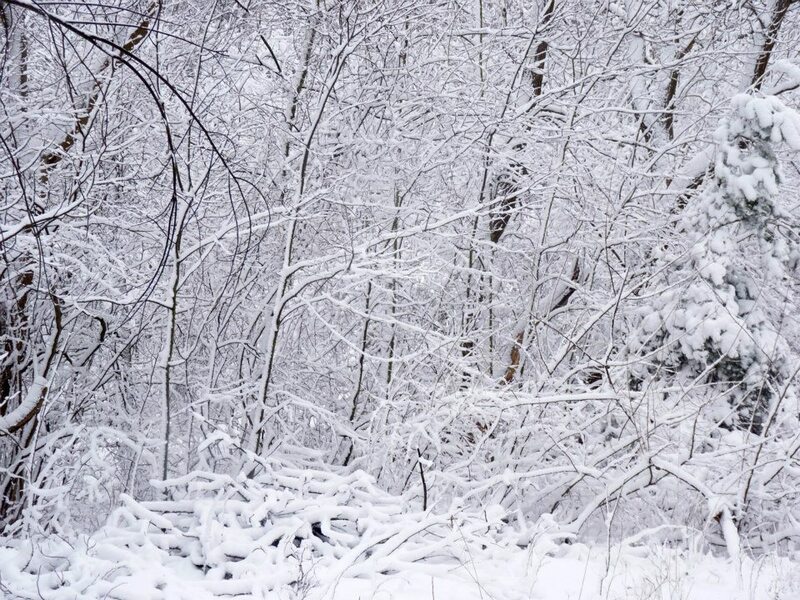 You recognize the importance of the winter months, they give the land a chance to rest. 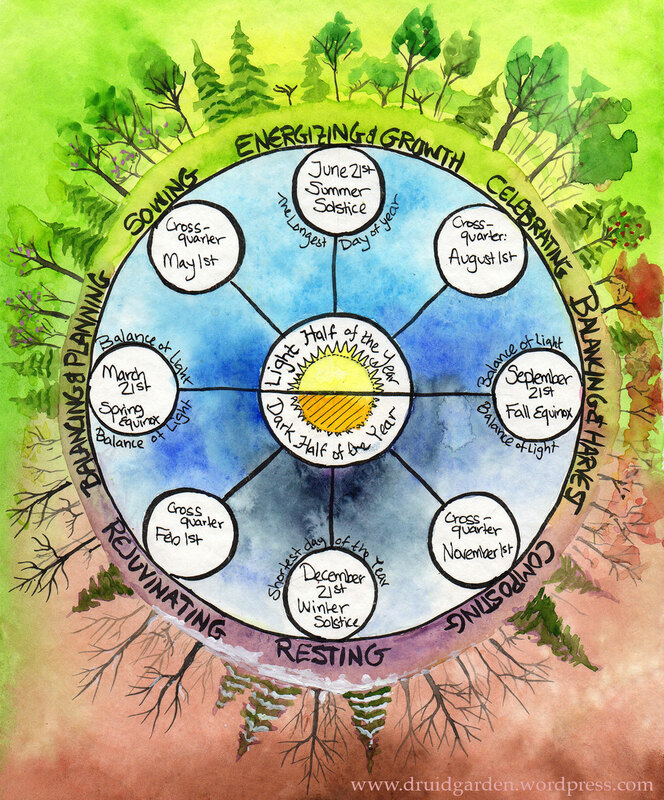 You equally recognize the importance of the glorious summer days By observing this wheel of the year, you grow to appreciate each of the seasons for their unique gifts. Your companions smile and hug you, and then slowly leave the grove. Take note of how your grove has changed in the cycle of one year. Take as much time as you want to remain here, exploring your grove. And when you are ready to return to physical world, you may do so.